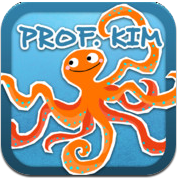 Professor Kim needs some help finding what is missing at the bottom of the deep blue ocean! This is a great memory and observation game for one or two players. These are two important early learning skills that will give kids a head start for school. Simply tap on the animal or object in the lower box that you don’t see in the ocean. If you miss one, you will see the correct answer flashing and get a fish that is not looking healthy! Try again to increase your scores, rack up healthy fish, and have fun. There are levels to master and then the levels change. Share with friends and family. Just tap the 2 Player button on the home page and you will each have a box to tap answers in – the fastest one wins! The iPhone version will be available in early September. Make it through Level One! Go Back and Get A Higher Score! I am a mom of 4 kids, two teenaged girls (16 and 15), a four year old boy and a two year old girl. We live in the lovely city of Munich in the South of Germany. 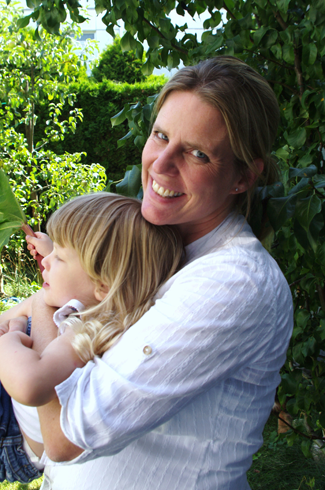 I am a primary school teacher and until our little girl is old enough for kindergarten I am a stay at home mom – and app developer. I love to play with my kids. Build things, play in the garden and play board games. I like to have family game evenings, because I think it is a great way of sharing time as a family. I wanted to have an iPad game where I can enjoy this with my kids. Professor Kim-What´s missing here? is a two player game! I think the best thing about this App is, that parents can play together with their kids on the same level. I really have to try hard to beat my 4 year old son on the first levels. The levels with more objects in the water get challenging for him, so I can relax a bit. But if I play against my 15 year old daughter… I loose most of the times. You need good observation skills to win! Yes, I think it is very hard to find good apps for kids. Therefore it is very helpful to have dedicated review pages like yours which help people to find quality apps. Also I would like to ask your readers to leave reviews on iTunes for every app they like. It´s a small thing for a user but it makes a huge difference to little developers as they get visible in the masses of apps!